Job roles from IT auditor to security engineer to CIO require or benefit from a GRC certification. Here are six top-rated governance, risk and compliance certifications that are worth the time, cost and effort. In the wake of several well-publicized corporate scandals about 15 years ago – Enron and WorldCom, to name two – and the passage of the Sarbanes-Oxley Act in 2002, organizations that must adhere to regulations for data security, financial accountability and consumer privacy found they couldn't do without someone to make sure internal processes are being carried out properly. Enter the need for competent governance, risk and compliance (GRC) professionals. The goal of GRC, in general, is to ensure that proper policies and controls are in place to reduce risk, to set up a system of checks and balances to alert personnel when new risks materialize and to manage business processes more efficiently and proactively. Professionals with a GRC certification must juggle stakeholder expectations with business objectives and ensure that organizational objectives are met while also meeting compliance requirements. That's an incredible amount of responsibility, and it's absolutely necessary in today's business climate. All kinds of job roles require or benefit from a GRC certification, including CIO, IT security analyst, security engineer or architect, information assurance program manager and senior IT auditor, among others. And getting GRC certified can be lucrative, as the median salary for professionals with governance-related certifications was $115,000 in 2017, second most of all certification categories according to the 2017 Global Knowledge Salary Report. 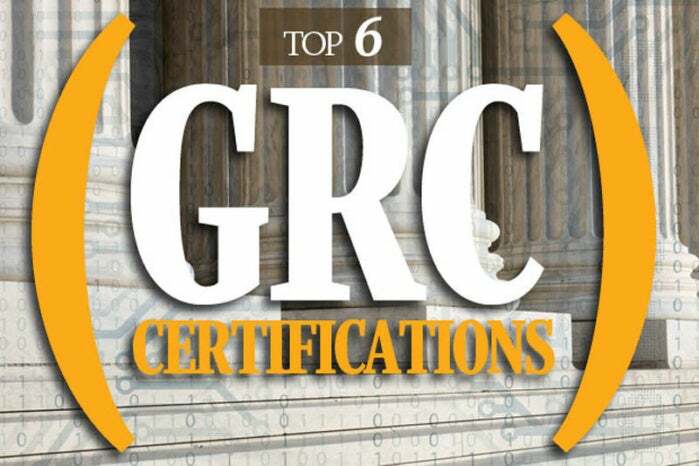 Read on to learn about our top six picks for GRC certifications, as well links to relevant GRC resources.